My work L’ homme Léger will be exhibited at the European parliament till july 2019. Caroline Nagtegaal van Doorn initiated the exhibition Pimp My Room and is ambassador of the Netherlands at the European parliament. 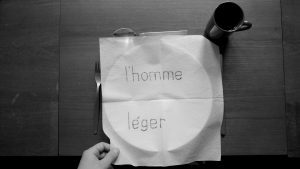 The work L’homme Léger features in Bal’s upcoming film Shimmer (release February 2019). The film explores what humanism might mean in present state globalised Europe. 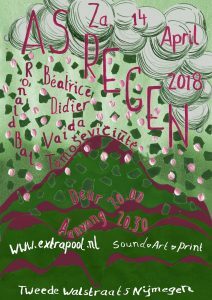 You are cordially invited to my performance Recarving Body Plant Image on April 14 at Extrapool in Nijmegen. From 20:00h to 22:00h. An evening of performances curated by Lilia Scheerder’s long-term exploration of narratology as tool for performance. The idea of Recarving Body Plant Image is rooted in my personal interest to rethink global archives and personal data. What image-making means as part of our social, cultural and political lives. Recarving Body Plant Image focuses on the ‘affection’ and ‘alienation’ of data and images-making through modern technology.